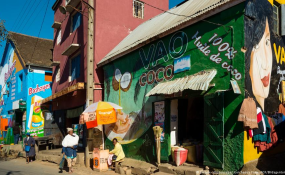 A street in Antananarivo (file photo). United Nations Secretary-General António Guterres has welcomed the formation on Monday of a government of national unity in Madagascar led by a non-partisan Prime Minister, as requested by the nation's leading constitutional court. According to media reports, the court ordered President Hery Rajaonarimampianina to form a new government with a "consensus" prime minister at its helm, on 25 May. That decision triggered fierce debate between government and opposition figures over its interpretation, but led to the appointment by the President, of Christian Ntsay, a non-partisan technocrat, as Prime Minister, on 4 June. The high-level political dispute, followed protests that took place initially against new electoral laws that the opposition said were barring candidates from taking part in elections scheduled for later this year, according to news reports. The Secretary-General commended the President and Malagasy political actors for "reaching a compromise in the interest of the people of Madagascar", said a statement issued by UN Spokesman Stéphane Dujarric. In the statement, the Secretary-General reiterated the commitment of the UN to support the holding of peaceful, credible and inclusive elections there this year and applauded the ongoing close coordination between the UN and international partners, including the African Union and the Southern African Development Community, in supporting "the Malagasy-led dialogue and reconciliation".